Snow Removal (City Ordinance 2007-1), Reminder to the Public; Snow, ice, slush or other impediment shall be removed from the sidewalks in the City by 1200 p.m., (noon) of the next day following a snowfall. Also do not shovel snow on or against a fire hydrant, into the city streets or roadways. Street and Sidewalk Obstructions (Chapter 12.04), Easy way to under stand the term Obstructions is to remember the City has what is called right-of-ways and easements this is an additional 16’ off of the hard surface roadways on both sides. This is a guide, streets and roads may very. Basketball hoops, Garbage cans, Boulders, Stumps and Signs, etc., Should not block sidewalks or right of ways. Parking (Ordinance 86-2), Main thing to remember is to park correctly and not to exceed 72 hours. No angle parking except where appropriately marked, do not block or impede the sidewalk. Also there is no long term parking on city Streets for Motor Homes, Camp Trailer or other vehicles. Abandoned Vehicles (City Ordinance 2002-7), It is unlawful to Leave Abandoned, Wrecked, Partially Dismantled, Unlicensed or Inoperative Vehicles or Machinery on Private or Public Property. Animal Control Regulations (Chapter 8.02), If you live within the City Limits of Belgrade and your dog is 6 months of age or older, you are required to license your dog with the Belgrade Police Department. You will need Proof of Rabies Vaccinations and if the dog is Spayed or Neutered the licensing fee is $20.00, if not it’s $30.00. Belgrade does have a leash law, requiring all dogs be kept on a leash when not on the owner’s property and only two dogs per city lot. If you dog is impounded it will be held at the Heart of the Valley Animal Shelter. Water Rules and Procedures (Water Ordinance 90-4), Watering may be done at any time of day EXCEPT 1200 p.m. (noon) to 6:00 p.m. These hours are in effect year round. Signs (City Ordinance 2005-8), It is required to remove any handbills, stickers, placards, posters or any other advertising matter of any kind or description on CITY property, or building, traffic control devises, signs, street lighting poles or power transmission poles with in two (2) day of conclusion of sale and/or event being advertised. You can not place signs on objects owned or controlled by other Companies or persons, i.e. North Western Energy, etc. or on State Highways such as Jackrabbit Lane, Broadway and Main Street. Refuse Collection and Removal (City Ordinance 85-2), Residential occupants and property owners are responsible for keeping one-half of the alley adjacent to their property clear of and all garbage and refuse. DO NOT use someone else’s garbage container without permission. That is a Criminal Offense. Business Licenses (City Ordinance 2005-18), If you operate a business within the city limits you are required to have a business license from City Hall. Live Animal Traps, Traps are available for lease if you have a problem with cats or other animals on your property. There is a $50.00 dollar deposit, plus $2.00 dollars every day the trap is out. Nuisance (City Ordinance 2002-6), Every owner, occupant, lessee or holder of any interest of real estate with the city is required to maintain such property. In short every property owner must keep up their property. 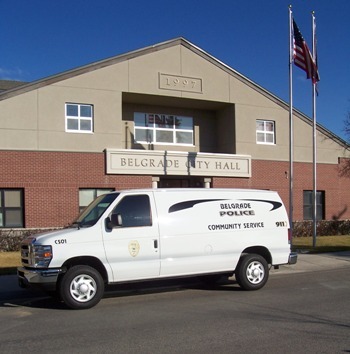 For a full and detailed look at the Belgrade City Ordinances you can go to the LAW link of the Belgrade Police Home Page.